Holiday Shopping can be daunting & time-consuming. Giving gift cards is a fast, easy, and thoughtful way to shower those we love during the holiday season. We are very happy to be able to facilitate this for our customers, new and old. 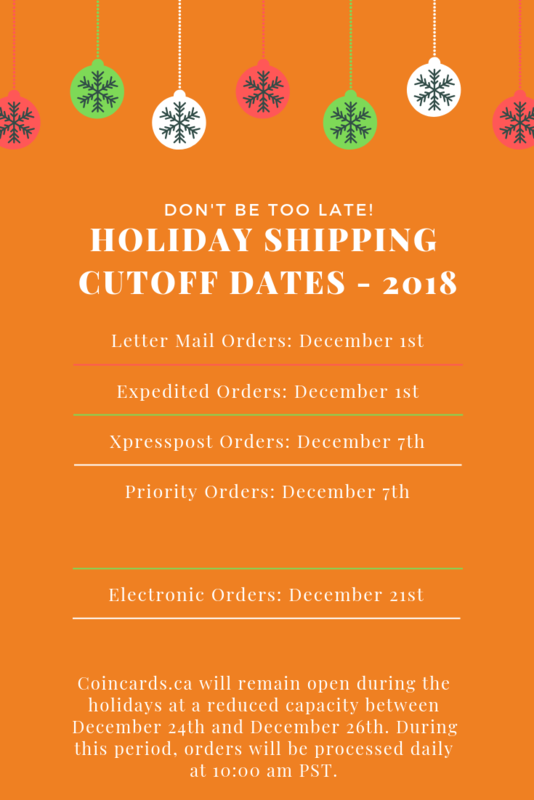 Please be mindful of our cut-off dates for physical orders. In order to ensure that all physical gift card orders are delivered before Christmas, all orders must be received no later than December 1st, 2018. This will allow us the necessary time to acquire and ship all orders. All electronic gift card orders must be received no later than December 21st, 2018, to ensure delivery by Christmas Day. Electronic Delivery – December 21st (Most cards will still be processed, but some vendors may delay cards past this point). **Please Note: Orders must have the necessary number of confirmations on the blockchain by the dates listed above to be considered “received”. To allow our staff some very deserved family time this holiday we will be modifying our processing times between December 24th & 26th. All gift card orders and customer support tickets will be processed once per day, around 10 a.m. PST. Newer Spending your Altcoins at Coincards.ca with Changelly – ETH, ZCASH, TETHER, DAI, XRP and Many More! Older Quick Delivery Catalog Expanded!